In the beginning, Zeir Anpin and Malchut are the six Sefirot of Zeir Anpin and a point of Malchut. As to all of the worlds and Partzufim from the World of Infinity to Zeir Anpin, they are designated solely for Malchut. Malchut is the created being that for now is a mere point: “the point in the heart.” We have to enlarge it! How, then, does the creature grow, and what does the Upper One have to do for it? In Malchut, in the point that is cleaving to his Chazeh, Zeir Anpin evokes a sensation of judgments (Dinim) and restrictions, that is, he stirs up the desires that are demanding to be fulfilled in order for this point to awaken and start growing. These restrictions descend to Malchut from the mother, Bina. Through the Upper Sefirot, GAR de Zeir Anpin, they enter Keter of Malchut. It is regarded as Rosh Hashanah or the beginning (head) of the year, the beginning of Malchut which is called “a year.” This is where her awakening starts. Awakening us to the state of Gadlut can be achieved solely by way of restrictions since only thanks to them (the Light of Hochma [Wisdom]) can we feel how much more needs to be corrected in us in order to prepare our spiritual vessels (Kelim). After all, we do have the vessels, but they are broken. At first, they are evoked through restrictions without any “sweetening,” but later, the Light of Hassadim (Mercy) descends and sweetens them (the state of being love-sick). Sweetening is what is regarded as correction. It is written that the Creator “created the evil inclination, and He gave the Torah as a spice.” To add a spice to egoistic desire means to sweeten it so as to correct and use it. Previously, this desire was “bitter,” but if it is “spiced” with the intention to bestow, then it is sweetened and can be used and fulfilled. This is what is called “sweetening” of the judgment. Judgment is the desire to receive for self-gratification, whereas sweetening is the same very desire, but with the intention to bestow. We only need to replace the intention. Question: How do I arrange my life to dedicate it entirely to the revelation of the Creator? Answer: It is easy to examine and organize corporeal life: Make sure that you are not harming others with any of your corporeal actions. In other words, you can’t be a thief or a criminal, live at someone else’s expense, and at the same time, act in order to bestow, as it were, in hopes that you are advancing toward correction. First of all, you need to correct yourself so as not to bring harm to others and not to deprive them even in some indirect manner. The rest of your work takes place solely in intention. Obviously, you should help a friend to find a job, for example, but, essentially, our entire work lies within the spiritual area by means of spiritual connection. We mustn’t copy various “altruistic” or “spiritual” organizations which provide “humanitarian” help and thereby corrupt people. They breed parasites by depriving people of the opportunity to become independent and take care of themselves. In fact, it is those very organizations who benefit from this. Hence, this is the rule by which I should advance toward the Creator: I take care of the corporeal needs inasmuch as it is necessary to sustain my existence, while the rest of my efforts are aimed solely at the revelation of the Creator in the connection with the friends. Question: In our world, people unite in order to succeed in some type of deal. How do we unite our souls? Answer: In order to succeed in spirituality, I need to connect with the people who wish to achieve the same condition and goal. And together, we have to discern that without such a special connection between us, we won’t envision this goal. As a matter of fact, it will suddenly disappear from between us! It isn’t somewhere “up there” as it has to be between us. Yet, due to the fact that we don’t cleave tightly together but rather walk away, this goal falls into an abyss that separates us. Indeed, the hate that divides us is infinite and unfathomable. It turns out that there are you and me, and we are separated by an abyss of infinite depth, at the bottom of which lies the spiritual goal, unification. And there is nothing we can do! We wish to unite with you and cannot as we keep uncovering this gap, so we strive to build a bridge above it every time. Thus, we construct bridge after bridge until we cover the entire, bottomless depth. 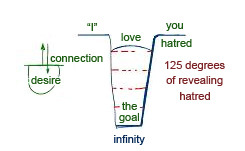 In this way we get 125 degrees of revelation of hate which is revealed because each time we uncover love over hate. Hate is determined by the depth of both our desires, and above it, we connect by way of the screen, the Returning Light, while we are building the vessel (Kli) that belongs to us both now. The screen is the connection between us, and hate is its internal desire. Hence, the greater the amount of Returning Light that ascends thanks to our connection, the more Upper Light we receive and experience pleasure. And by feeling this pleasure, we delight each other! Everyone is delighted by the fact that the other is feeling pleased. Otherwise, there is nothing else we can give for we bestow to each other our own individual pleasure. As a matter of fact, all of us are created as receivers, so we can only receive. We can bestow solely in intention. And what else can I possibly give to someone other than my intention? The Zohar, Chapter “VeYechi (And Jacob Lived),” Item 462: Happy are the righteous who are rewarded with that upper light, the illuminating mirror that shines to all sides, to the right and to the left. Each of those righteous receives in his share what he should, meaning receives according to his actions in this world. And there are some who are ashamed by that light of which their friend received more to illuminate. We want to know all of these details, to understand where they are situated, where the root and the branch of every word and its spiritual quality is. We look for all these gradations of qualities that The Zohar speaks of within ourselves. Obviously, they are all found only within us, at the still, vegetative, animate, and speaking levels of our desires. We perceive only the reality that exists inside our soul. Even now, we remain inside our soul, inside this Kli (desire); all the phenomena occur in it. It is said that after death the soul “in the heavens” is asked only two questions. “Did you study the Torah (did you draw upon yourself the Light that Reforms)? Were you awaiting salvation (for when this Light will correct you)?” We must always remain in this intention. Laitman.com Post: Are You Asking Yourself The Right Question During Zohar Study? Question: It is written that we have to be joyous on Sukkot. What does that mean? Answer: Joy is an effect of attainment and unification; it is joy from bringing contentment to the Creator. 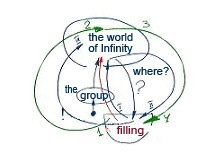 There is the World of Infinity, the vessel of the Creator, which is empty. I fill the Creator through the group, and this act of fulfilling Him causes me to feel joy. At first, I felt empty and demanded fulfillment from the Creator. However, thanks to studying with the group, I realized that fulfillment comes solely from fulfilling the Creator. I am filled with bestowal to the Creator in the same way as a mother is filled with joy when her child is fulfilled. Ultimately, it makes no difference to me whether I give or receive. The goal is to be fulfilled which I can achieve solely by way of fulfilling Him. When I fulfill Him, I fulfill myself. However, if I fulfill Him for self gratification, it is egoism (Klipa, shell); it’s similar to working for a reward. However, if I fulfill myself in order to fulfill Him, it is bestowal (holiness). If I fulfill Him in order to fulfill myself, it is reception (impurity). Diagram: Impurity: 1-2) I fill Him, 3-4) in order to get filled myself. Holiness: I) I raise MAN to Him, II) to make Him fill me, III) so that by filling myself, IV) I could fulfill Him. Question: Is it possible to hold on to the Surrounding Light (Ohr Makif) during the day, when I come out of the group and the lesson into the external world? Answer: The law of any physical field states that the intensity (of light or any other stimulus) decreases proportionally to the distance of the source squared. When you move twice as far away from the source, the intensity decreases by four times. But if you come twice as close, then the intensity increases by four times. In the spiritual world there is no source of Light because the Light fills the entire universe. Therefore its influence is the same no matter where you are. You think that you come out of the lesson and enter the outside world, while in fact, all the spatial changes take place inside you. You go from one desire to another. All the “places” are your desires. You are traveling inside yourself. Therefore, everything depends on how much you awaken the Light inside the desires. The Light is present in them equally and fully. It doesn’t matter where you are – out on the street or at the lesson in the group. I might be physically present in the group, but be far away in my thoughts. The degree of my connection with the Light depends only on the intention: How much do I desire to be connected to it? How can we unite with each other? It is possible only if a person with his desire exists in the friend and the friend within him. Everyone has to absorb the desire of the other and work with it, and in doing so, they connect. Since their desire is aimed at the same goal, through their mutual work they create a common force of aspiration to go forth. This force guarantees their progress and is called Arvut (mutual guarantee). This is a criterion to verify the extent of our connectedness. The distance between us amounts to 125 degrees (steps), 125 parts of my egoistic desire. But gradually, correcting it through the actions “for your sake,” I come closer to you in my work for bestowal. That is what is called “love the other as you love yourself.” In other words, I employ your desire to annul mine before it and in so doing, I correct my desire. My desire remains but because I have gone such a distance to reach you, I have made my desire bestowing. Nothing has changed; I’ve only added the intention. And the distance between us disappeared for I annihilated it with my intention! And what does this “other” want? He wants to attain adhesion with the Creator, just like you do. So, there is only one thing you need to help him with: to become one with the Creator (together with you). This single intention connects us all as one. Hence we say that we are all in one boat, and it goes in one direction. The closer I come to you, the closer I come to the Creator. The Zohar is just like the Torah in that there is no need to read it in an orderly fashion. You can open up the book anywhere you want to! It’s similar to Psalms; you can open up any psalm and read it. You can even begin reading any psalm starting in the middle of it. The most important thing when reading holy books (meaning books written by those who attain the Creator through the quality of holiness, bestowal, Bina) is not what you are reading or the things you read about, but the intention: What do you want to attain by reading? One way or another you are reading about the Upper World, which you don’t feel or understand. The Zohar is the highest source of all the holy books. It is the most powerful source of Upper Light, the Light of Correction. It’s like an infusion to a sick person, or like a medicine that you take. What do you want to attain by taking this medicine? What does "being healthy" mean to you? Depending on this, the force of The Book of Zohar can be the elixir of life for you, or a deadly poison! Therefore, before opening up this book, you must think and feel, attune yourself, prepare and discern: What are you hoping to receive from it now? You are hoping to receive medicine, which is symbolized by a snake. A snake’s venom can be truly poisonous, or it can be the remedy for every illness. Therefore, before opening up The Book of Zohar, we must have the right intention so instead of attracting deadly poison, we will attract the elixir of life that saves us. When people study the Torah without the right intention, it becomes dry and lifeless. This is even more dangerous when we are reading The Book of Zohar, the greatest source of power. It wasn’t an accident that for so long The Zohar was concealed from regular people and revealed to Kabbalists. A Kabbalist, meaning a person who attained the right desire, was sure to find this book in some way. It was sent to him through someone or in some other way. He was brought to the place where he could find it. However, it was not revealed to other people because in the past we were unable to arm ourselves with the right intention. That’s why The Zohar would only have brought harm upon us. Today, however, we open up The Book of Zohar with the intention that it will bring us goodness, that it will become the source of life for us instead of turning into deadly poison. The Zohar contains such enormous force that we must be careful to open it only together and with the right intention. That is why it has become revealed in our time and offers us incredible opportunities. We want to offer it to everyone. However, every person must know that only the right intention while studying The Zohar can turn it into the elixir of life.